As parents we are always looking for ways to boost our children’s creativity or imagination. 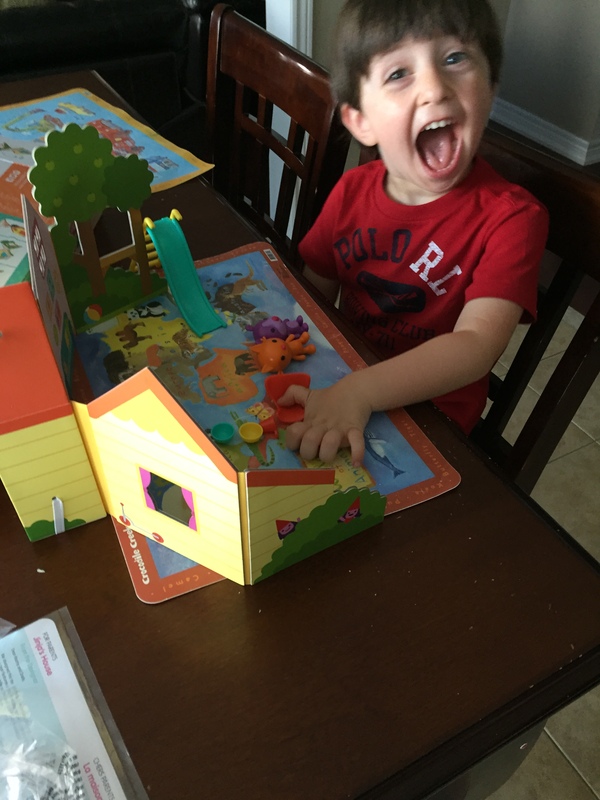 I know I always look for things that will help foster play and speech for little T ever since he was diagnosed with a minor speech delay when he was 2 years old. Thats why when I heard that Sago Mini introduced a new playset that also included an app, I knew I had to try it. This adorable new playset is for kids age 3+ and is called Jinja’s House. Thoughtfully designed to capture kids’ imaginations, the portable toy house offers endless possibilities for role playing and creativity. The house opens to over two feet wide revealing lovely indoor and outdoor play areas to let kids make up their own stores. With interchangeable play accessories like a movable slide, table and chairs, tiny slices of pizza and miniature postcards, kids can really make the experience their own. And when it’s time to tidy up, all the accessories fit neatly inside. The portable playset folds up and can be secured with attached band; the carrying handle makes it easy for kids to take anywhere. The set is also small enough to fit in a parent’s bag, making it perfect for on the go fun. It was perfect for T. We got to have a conversation about all of the accessories, what they are and where we can put them. He got to make up his own story about what Jinja and Rosie were doing while they were playing. It really brought out his imagination! You can see it in action here! Jinja’s House is available on Amazon.com and Indigo’s online store for $29.99 USD/ $34.99 CAD. What I also love about Sago Mini, is they offer a number of Preschool Apps. Since we had just played with Jinja and Rosie, T wanted to continue to play with them. We downloaded Sago Mini Friends. Here you can take all the Sago Mini friends on playdates! Since play time is so important for kids and their social skills, this app invites kids to lead the play. 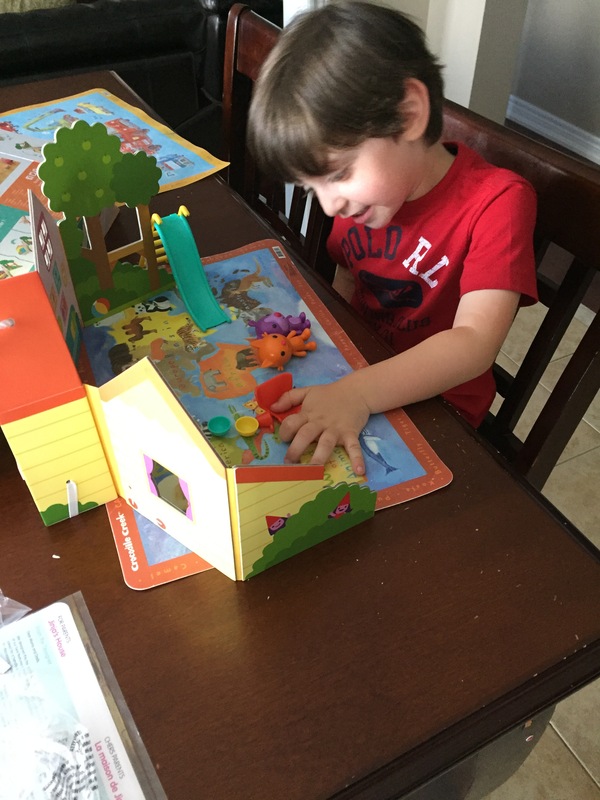 You can help Robin fix a birdhouse, play dress up, pop and blow up balloons, you name it, Sago Mini has thought of it! T loved it, and what’s better is that we got to work on his words and articulation as we went through each of the playdates, talking about what the friends were doing. Mom approved. If you aren’t familiar with Sago Mini, check them out. They are an award-winning toy company with over 10 million downloads, 18 apps and a new line of toys. Beautifully detailed to seed imagination and grow wonder, Sago Mini is beloved by preschoolers around the world. It brings thoughtful design to life for both kids and parents. Based in Toronto, Sago Mini is a subsidiary of Toca Boca, the No. 1 mobile-first kids brand in the App Store. To learn more, visit sagomini.com or follow on Facebook, Twitter, or Instagram. Come back and tell me what you love about Sago Mini and stay tuned for more! What Do I Need To Do To Get Some Sleep Around Here?